Today it was finally time to hire our first car! For the next few days we will be driving across the Yamanashi Highway, also known as the Trans-Kyushu route. This scenic road travels past a number of Kyūhū's top destinations including the hot spring towns of Kurokawa and Yufuin, the scenic Kujū mountains and the humongous Mount Aso volcano. Slated for today’s initial leg we had a morning visit to Yufuin after which we'd continue along the Yamanashi Highway for some hiking around the Kujū mountains. 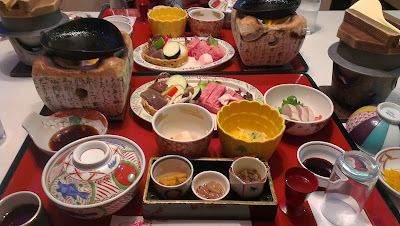 We had another included breakfast with Beppu’s Nishitetsu Resort Inn today which we enjoyed on the first floor. The car place didn't open until 8am so we were not in a huge rush to get going especially early. After breakfast we collected out bags, checked out of the hotel and walked up to Beppu station. I had floated the idea of leaving our luggage at the hotel while we collected the car though Kate vetoed that for some reason. 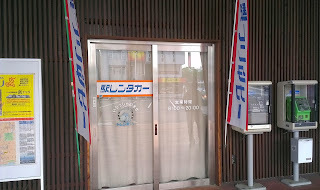 We had booked our car on the ToCoo Japanese car rental website a month or two before our trip. Since we wanted to drive from Beppu to Kumamoto, we had to pick a company that offered this service at reasonable rate. JR Eki Rental Car fit the bill and cost us a total of ¥20,500 for three days, including the drop-off fee. We arrived at the station a little early and found that the office (outside the station on the eastern side) was still closed. There were only a few minutes to go though so we opted to just wait outside the shop. A short time later another guy showed up and formed a line by jumping right in front of us! After the store opened we had to then endure a ten minute additional wait while that first guy got sorted out. We spent the time trying to guess what car we'd get. We wanted the Nissan cube! Once it was our turn we went into the small office to fill out some forms, and get our documents scanned (International/ Australian licence, passport). The insurance situation and what we should do in case of an accident was explained to us as well. I also double checked that it was ok for both of us to drive. With that all done the lady took outside to where another staff member had driven our car. Drum roll... it was a Mazda Demio! Outside of Japan this car is known as a Mazda 2. When we were booking we had looked into getting a Kei class car, which are these tiny 660cc vehicles manufactured only in Japan to get around some regulations. That’s a smaller engine than some motorcycles! I thought it would be fun to drive such a small car through we ultimately decided to get the next size (S: 1000-1300cc) up for safety and comfort reasons. The price was only very slightly more expensive. So the guy who produced our car gave us quick tour of all the minor scratches and marked them on a diagram. Since this was our first rental car we had quite a detailed look ourselves and then signed some paper to say we agreed with the assessment. It was then time to get in! The man asked us if we were ok with everything and gave us a quick demo of some of the controls and the Japanese GPS. He also reconfirmed where we were dropping it off and gave us a map of the petrol stations we should use in Kumamoto. We had a little slip of paper we needed to get the petrol attendants to fill out. I'd been nominated as the first driver, and I found it a little awkward having everyone watch! I didn't want to sit fiddling with the GPS for ages so we just drove off and ended up squeezing down some weird and really narrow site street in our effort to get to the main road. It got a little hairy so we stopped to reroute and were soon back underway towards Yufuin. Once we found the main road it was much easier driving and we followed the route we had taken yesterday up the mountains and past the ropeway. The drive was a very scenic trip and we could see many tall and smooth mountains towering above us. Along the way we stopped at a bit of a lookout to take some photos. One of the strange things about driving in Japan is the very slow speed limits. A road that would get 70-80km/h in Australia would only get 40-50km/h in Japan. Major roads as low as 30km/h were not uncommon! The roads were narrower and there is often practically no shoulder but really nothing that would justify such limitations. So people just ignore the speed limits. Almost everyone on the road was speeding by about 15-20km/h, which meant the traffic didn't flow too badly. Apparently the police don't often enforce limits but when they do, books are thrown. Another thing we noticed was that there seemed to be lots of road work, though it wasn't too disruptive. Since it was our first time we'd be driving and finding a park in Japan, I had made sure to scout out parking in Yufuin beforehand. It was actually the only place I could find online though once we arrived we realised there were heaps available and the price varied wildly. Yeah, almost all were paid. However they were not too expensive; we paid a couple hundred yen for two hours. Our car park was located next to an unpaid supermarket’s (customers only), and we entered through a boom gate. It was quite a big area with lots of spaces though barely any were taken. I guess because it was still early, though we felt a little uneasy. Once we had parked someone who was working at the car park appeared and helped direct us over to the main street. Yufuin is a medium sized town of around eleven thousand people and is located only about ten kilometres from Beppu on the other side of a mountain range. 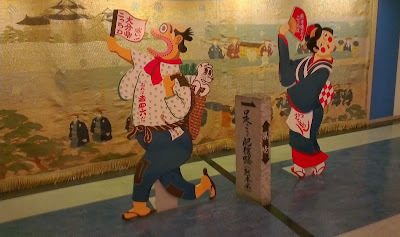 Like Beppu it’s a popular hot spring resort though Yufuin has managed to preserve more of an idyllic character. In contrast to other onsen towns, Yufuin has become somewhat of a trendy shopping location and many shops line the main street leading to the scenic Lake Kinrinko at the base of Mount Yufu. Although it was still quite early and quiet when we arrived all the shops were already open. We headed for the pond and had a lot of fun checking out the various stores lining the path. We were pleasantly surprised to find that the goods sold within were genuinely interesting and were not the usual touristy crap. Nothing was overly expensive either. Most shops specialised in one thing or another such as honey, soy sauce, cake, cat things, salt, cheesecake, crystals, dog things, t-shirts and cheese. There was even one store with fish that would eat the dead parts of your feet (ew?)! As there were so many options we decided to have a look at everything on the way down and then buy on the trip back. A bit closer to the pond we saw some cheaper parking, though these places looked a bit dodgier and harder to get to. Eventually we reached the lake and followed the path that led around the edge. Within the pond we could see fishies!! Looking across the lake we saw a hotel and French restaurant behind which Mount Yufu towered up into the sky. Apart from the fish there were also many ducks, and a bumblebee! I videoed it rolling around inside a flower! By the time we started heading back the town had become quite a bit busier; we saw lots of Korean students in honey shop eating honey ice-cream. Along the way we found a nice little entrance to a themed set of shops that had gardens out the front and were designed to have an old fashioned European sort of feel. Within one of these stores we tried the various free samples and ended up buying a box of delicious lime biscuits. Nearby we saw a hobby sort of shop that had a big statue of Tetsujin out the front; we'd seen the gigantic 18 metre version in Kōbe last year. Also in this area we found some really cute and cheap (¥1000?) money boxes. Kate really wanted one but they looked too big and breakable to carry back to Australia. What she was able to buy though was a cute T-Shirt, soy rice crackers, sesame seasoning power and some honey chips. For my own part I got various cakes; first a small amount of Baum cake and then a much larger portion. At the cheesecake shop I bought a small piece of cheesecake. Since this cake was cold and perishable I had to eat it straight away- it was delicious! 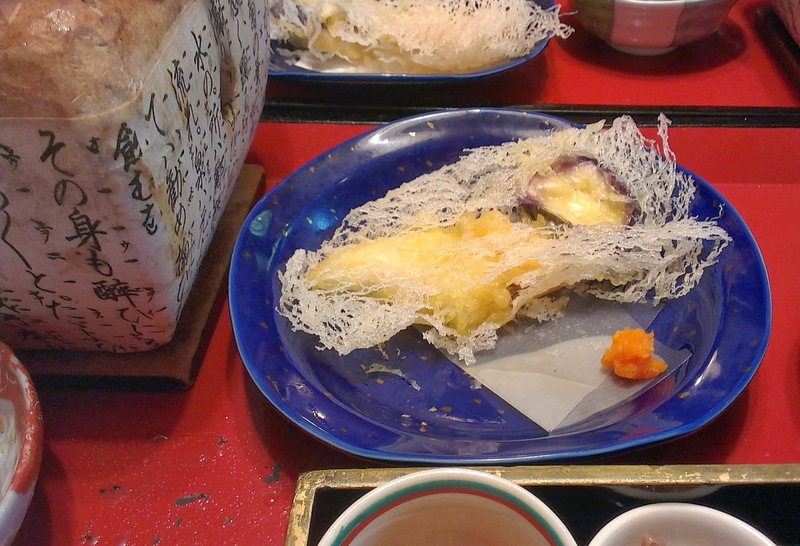 Admittedly it wasn't the same or quite as nice as the godly cheese cakes available in Hakotate though. Once we arrived back at the car we quickly rushed through the neighbouring A-Coop supermarket buying food and drinks for lunch and our upcoming hike. We were in a hurry because our parking time was about to run out- it was only later we realised we could've just moved the car to the supermarket car park! So with our shopping done it was time to hit the road again and head for the Kujū mountains! There was no phone number or anything we could use to look up our destination on our car’s GPS though we were able to just tap on the map to go to a certain Y-junction that looked like our destination. After a forty minute drive we arrived at the Chojabaru visitor centre and parked outside one of buildings. Another one of the buildings was a nature centre and we asked the person working there if there were any hiking maps. There was, and although it was in Japanese, approximate walking times for sections of the track were marked, which was very handy. We also had the map from Japan Guide, which had walking times marked as well. Before leaving, we also had a brief look around the centre which contained information on geology and such things. Apart from the trail-head here at Chojabaru, a little further down the road sits the Makinoto trail-head which is closer to a greater number of the Kujū Mountain peaks. We didn't have time to do a full circuit from Chojabaru so we decided to start from Makinoto, as its closer to the higher peaks. We especially needed to keep an eye on the time today because we'd be staying in a Ryokan tonight and had to make sure we arrived on time or we'd potentially miss dinner. We were not actually sure if we could even make it to any of the peaks or if we would have to turn back half way. At Makinoto we found a small car park, shop and toilets. After parking we walked over to the start of the trail. There was a map and some hiking forms we filled out before beginning our climb up the path. This first section was a really steep sealed path that alternated between being a ramp and steps. The climb was very tiring, though we ended up making it to the top in much less time than our maps said it would take. Half way up we stopped at a viewing platform to look at the pretty rolling hills. In contrast to the mountains we had been climbing a few days ago, there was no snow up here at all! Thankfully the steep gradient didn't continue the entire way and once we reached the end of the first section we found that it levelled out considerably as we walked along the mountain ridges. Before embarking on the next section we made sure to climb to the top of the little peak we'd reached to get a good view out towards our possible destination peaks: Kujū, Nakadake and Hosshhō. The trail was no longer sealed beyond this point and was instead just a rough boulder or dirt path. Even so, the path was well maintained with occasional steps, chains and ladders. During the bouldery sections there were splashes of paint to lead the way. In the wider and more open areas we found barriers in place to prevent us wandering off into the wilderness. Along the way we started seeing lots of school groups walking past in the other direction. As each student passed they greeted us with "Haro”, and it got a little exhausting replying "Konnichiwa" to all thirty odd students each time we encountered a group. I wondered why they were taught hello as "Haro" since "Hero" sounds a lot closer to my ear. I also wondered if they perhaps had started at the Chojabaru visitor centre this morning and were walking one way to a bus at Makinoto. It was very scenic walking along the mountain paths, some sections had us climbing through cool soily areas with lots of plants. Other times we climbed over big boulders or walked along the exposed ridge that gave us excellent views of the surrounding peaks against the blue sky. We could see someone up on Mt. 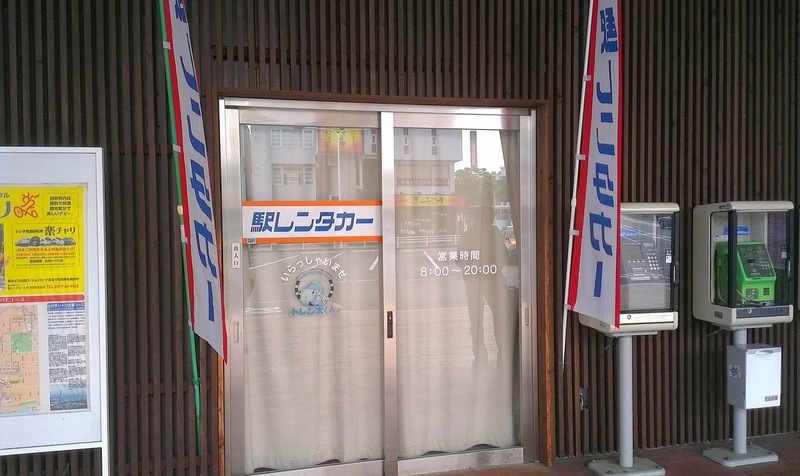 Hosshō! Can you? We were headed for the two highest peaks in the range, the eponymous Kujū peak at 1786m tall and the slightly higher Nakadake peak (1791m). On the way we passed many different junctions most of which let up to the nearby peak of Hosshō (1762m). We didn't go up there as it wasn't quite as tall as the other peaks and we certainly didn't have time for them all. I've now learnt though that the paths up to Hosshō contain steam emitting vents, which sounds pretty cool! Maybe it would’ve been worth it to go up one side and down another! Speaking of steam, or well volcanoes, the soil we were walking upon was very red in places and the terrain seemed volcanic in nature, while the actual organic nature mainly consisted of small grasses and shrubs. At the end of one of these rocky sections we came to a clearing and were very surprised to find a toilet block! Although we both kind of needed to go we didn't because the toilets had a fee (which was fair enough). From the clearing we could clearly see the two peaks and would soon have to decide which one we wanted to tackle. In this general area we found a sign stating that one of the paths elsewhere had been closed due to excessive volcanism. Once we reached the junction between the two tallest peaks we decided upon Kujū since it was only very slightly lower than Nakadate and apparently has superior views. So, all that was left was the final ten minute scramble up to the top! A good thing too as it was getting very close to the time we'd have to start heading back. The climb up was steep and slippery due to the large quantity of loose gravelly rocks. We met them walking back down! There was a rope available which I used to pull myself up and give my legs a rest; Kate didn't bother with this. After a slippery ten minutes we finally reached the top and were rewarded with a lovey (slightly hazy) view, marker and hordes of little insects! We stopped up here to have a well earned rest and snack though the food didn't seem to help with the bug situation. Although it was still a little hazy, the air today was clearer than yesterday’s so we were able to properly appreciate our height. Before long, after only a little rest and appreciation we had to say goodbye and start hurrying back to the car. We'd now swapped places with orange hat! Kate really wanted to climb up to Nakadate as well but had to concede that we really needed to be heading back! We paced it out and actually managed to make it back to the car in excellent time. Along the way I slipped and hit my shin and at another point Kate fell over however we were both ok.
We walked fast enough to overtake a couple of people though we didn't see nearly as many as we had earlier- the kids were long gone. From the top of the first big hill we had another look at the view and could see all the way back down to the trailhead. The formerly crowded car park was now nearly empty and we could easily spot our car. The final trip back downhill was much faster than the slog up and we arrived a little after 5pm, this left us a good 60 minutes to get to our hotel, which was located about a 40km drive away. The shop at the bottom was still open and we had a brief look to find it sold, apart from food, trekking goods and commemoration medals. Before hitting the road again we did something with the hiking notice we had filled out to say that we had returned safely. For some reason we didn't set the GPS for this trip and instead relied upon my phone for directions. Big mistake as our pocket WiFi didn't have any reception for most of the way and we somehow managed to miss the turn off- Tsuetate isn't located on the Yamanashi Highway. Thankfully, we ended up working out where to go and were soon back on track. Otherwise the drive went well and we didn't encounter anything stressful; a few tunnels, minor roadwork, and such. I have another comment about driving in Japan. Unlike in Australia no one tailgated or drove aggressively, this is in spite of the barely regarded speed limits which meant that different drivers went different speeds. The lack of tailgating was really welcome- I wish it were like that here. Arriving at the hotel was quite an event! As we pulled in some people came out to greet us and direct our car into a park. They had brought one of those bag trolleys with them and before they stacked it I warned that my bag weighed 30kg. We had actually planned to keep most of our things in the car but since they had bought the trolley and seemed pretty eager we just let them do their thing. The staff started out with a bit of English though switched to Japanese when I replied. Upon starting the check-in process at the counter we were told that we had been upgraded to a bigger room! For some reason they thought we were on our honeymoon! I said we were actually not married yet, though we still got to keep the big room. Like with the previous hotel we'd also be paying a bathing tax, this time upon checkout. We had prepaid the rest of the hotel online- though it didn't get deducted until months after we booked. Once we had finished checking in it was time for a tour of the hotel and the lady asked if we wanted it in Japanese or English. I asked for English so Kate could understand and they called over a specific guy. He seemed a little nervous as he took up the elevator! Usually we got smaller rooms in Japanese style hotels since they're more space efficient but this was the biggest we'd ever had out of any hotel. We made sounds of amazement upon entering and our guide commented on the Tatami mats. When we took our shoes off at the entrance he discreetly popped them into a little cupboard. We then all sat down at a little table and the hotel dude explained about the various facilities. Since he sat Seiza, we did as well, Kate was fine by the end though my legs were pain. This ryokan hotel was huge! Along with our hotel information there was a map of the ryokan and our guide pointed out that there were five different onsen baths available. Three were located in the main building, one was a short distance away in another building while the final one could be reached with a short shuttle bus trip. Inside the hotel information booklet there were also pictures of each onsen. 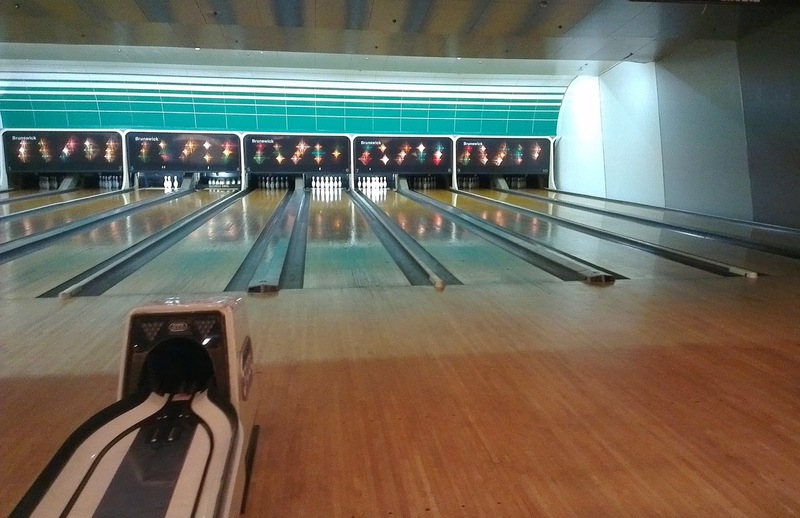 Apart from the baths there was also an entertainment section that included a bowling alley and we were given a ticket for a free game each! Along with that ticket we also received a voucher for breakfast and a free hot potato that would be dispensed from an area near the bowling alley. Before leaving Mr. Hotel also showed us on the map where dinner was and confirmed the time (we had selected back when we booked). So we were then free to explore our room! It truly was huge; in one of the cupboards we found the futons (they'd be set up after dinner); there were at least ten stored away in there! We had a little outside area that looked over the fast flowing river, a full bathroom, two other sinks and a few other rooms, one of which that had some massage equipment inside. In the main area we had a little flat screen TV and on our table there were a few snacks! Since we still had some time until dinner we decided to go down and have a bath at one of the onsen. I think we choose the High Class bath because it was the closest. We still had to maze our way through the hotel to get there and at one point along our journey we got a great view of the river through some big windows. Inside there were a lot of different baths, and even an outdoor section. Apparently a lady came through the girls section to test the water in each bath. Also Kate finally encountered someone else inside an onsen! Somehow she'd got away without seeing anyone her first four times. When we had booked this hotel it almost seemed too good to be true with the amount of delicious food listed with the booking. So we were really excited! Upon arriving at our table we found a massive amount of food laid out and as we ate, more and more dishes were brought over for us to enjoy. When we first sat down lumps of wax were ignited beneath a bowl of rice and a cast iron stove. We were told that the rice would be cooked in twenty minutes and we could use the iron grill to cook the food on a certain plate. She also gave us some brief pointers on how to eat the other foods, like: dip this is that, drink this etc. The plate with food to cook had a variety of vegetables as well as some delicious meats. There was also a glob of fat we could use to lube up the hot plate. We had wanted to do this self cooking for a long time- it was a lot of fun! Kate actually cooked some her sashimi on the grill (the sacrilege! I can’t imagine), Kate's a bit weak towards raw fish. I made sure no one was looking at least! As mentioned, the more we ate the more was served! The tempura we were brought was prepared differently than what’s usual with a lighter batter that coated in a web like manner. 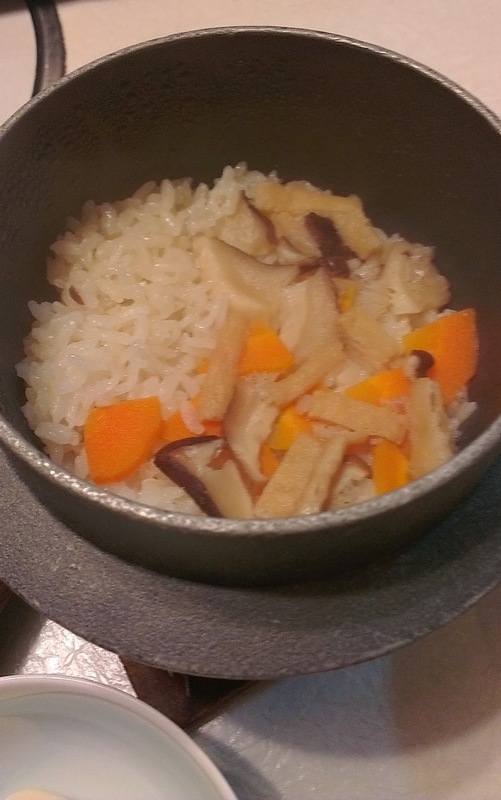 Once the rice’s fuel had burnt itself out, the rice was done and we found it to be really delicious! It contained flavouring and vegetables within. For desert we received some sort of jelly which was just as tasty as the rest of the meal! Finally we were given our sweet potatoes in a plastic bag! The staff said we could have them now even though we didn't have our coupon. We were way too full to eat them straight away and later the bag became wet and foggy so they were somewhat less appetizing (we threw them out). Next we thought we'd use our bowling coupon! 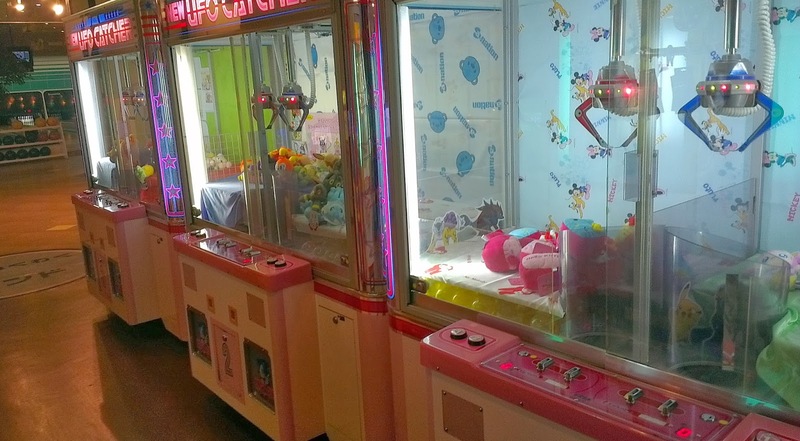 We went down to the amusement area and found game machines, UFO catchers, ping pong, karaoke rooms and the bowling alley. There was a heap (like 70) of UFO and other machines though they looked a little dodgy- no one was using them. The bowling alley was pretty big and had eight lanes! Our coupons didn't include shoe hire but it only cost us 150 yen to add this to our room bill. With just two people playing our one game went pretty quickly but it was still lots of fun playing in our Yukata! The place wasn’t too full though and there were a few others bowling with us. I’m pretty awful at bowling and Kate almost always beats me, however, somehow I managed to get a string of strikes right at the end (evening out my string of gutters) and unexpectedly won the game (106-85)! After bowling we explored around the hotel a bit more and had a look at the decently sized souvenir shop. Finally, before bed we went to check out the prefectural boarder! This hotel is apparently the only one in Japan built across two prefectures and there was a little display on each floor showing the two different sides! When we arrived back at our room we found our beds had been made up for us and we soon went to sleep. Well, I spent a bit of time using the hotels free WiFi before going to sleep- our pocket WiFi (e-connect) was still out of range even in Tsuetate. So I was grateful for the hotel's internet. Tomorrow was another big day! We planned to continue along the Yamanashi Highway to Mt. Aso, which is the largest volcano in Japan and one of the largest in the entire world. Although active it’s not terribly so and you can actually drive right up to the crater and have a look inside with only a minor chance of death. A total of six people died between 1989 and 1997 due to gas inhalation. If we survived Mt. Aso, we’d then stay that night at a sort of B&B in the small town of Minami-Aso. Or, are you considering visiting or have you recently travelled to Yufuin, Mt. Kujū or even Tsuetate? It sounds like a fantastic trip! Wonderfully detailed information. Probably the best I've found on the internet. Did you consider taking the Yufuin no mori special train? Thank you for the comment and kind words! I had a look at the Yufuin no mori, and it looks cool traveling through the country side, but we really needed to hire a car as we wanted to visit Takachiho, the Kuju mountains and Mt Aso on our way through to Kumamoto. So it made the most amount of sense for us to have our own transportation. Though I do much prefer trains given the option :). Many thanks for this post. Very detailed of the hike to Mt Kuju (I've been searching for the details). Are you able to tell me how long does it take from Makinoto Pass to Kuju at your speed please? Thanks. I had a look at the photos we took right at the start of the trip and according to those we started at about 1:38pm, and arrived at the summit of Mt. Kuji at about 3:24pm, so 106 minutes or 1 hour and 46 minutes.